Pro-Palestinian and pro-Israeli groups both demonstrated, kept apart by police barricades. WHAT: Protests sparked by the ongoing conflict in Gaza, which has now resulted in the deaths of more than 1,000 Palestinians and 45 Israelis. 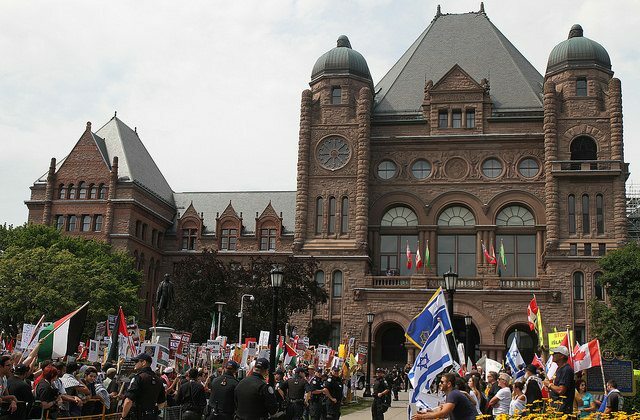 Pro-Palestinian and pro-Israeli groups both gathered in front of the legislature—police barricades kept them separated, and no injuries or arrests were reported. Police later shut down University Avenue while Palestinian protestors marched to the the U.S. Consulate. While most pro-Israeli demonstrators remained behind at Queen’s Park, some also walked to the consulate, using the the other side of the street. There were occasional confrontations as the two groups proceeded down University, and police on horses and bicycles were on hand to maintain a distance between them.